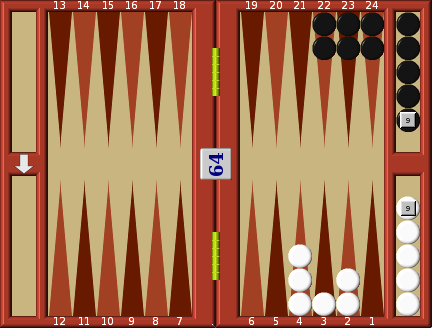 A great many mistakes can be made in the endgame, so you need to familiarise yourself with the correct principles of play in different backgammon endgame situations. What a happy moment for White! The first thing White does in this situation, if the cube is in his possession, is to double Black. Black has only one man on the bar and the rest of his men safely in his home board, so there is no hope of a gammon. So why risk making an error? Double Black first, and unless he is a hopeless gambler he will refuse. Let us suppose that Black holds the cube and you must continue to play. You throw the dice and get 5:4. 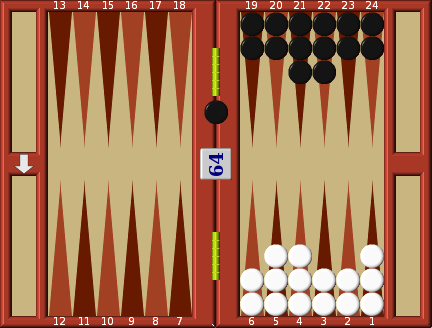 At first sight, 5:4 appears a safe throw and it does not seem to matter much how you move it. Yet the wrong move now can be a fatal error. The problem is how to move it so that on the following throw you can play a high double, such as 6:6 or 5:5 without exposing blot to Black. 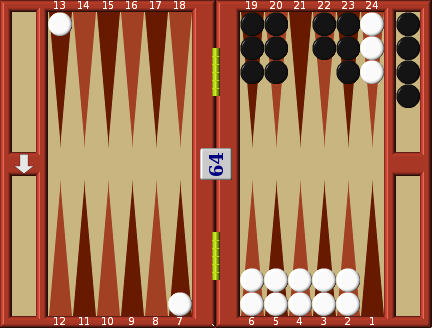 Before reading any further, set out this situation on your own board, and work out the correct move, so that after you have completed it you can play 6:6 or 5:5 in safety. A move 13-4 is a correct move, but there are many incorrect ones, such as 13-8, 10-6. After such a move 6:6 will expose a blot. 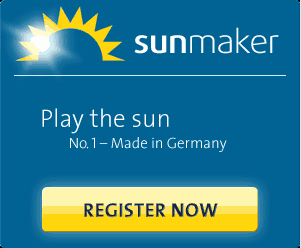 10-1 would also be wrong; you could not now play 6:6 or 5:5 without exposing a blot. Once all your men are in the home board, the easiest way to check your end play is to memorise the safe and dangerous patterns of men on the board. Diagram illustrates a safe pattern. 6:6, 5:5 or 6:5 can all be played in complete safety. 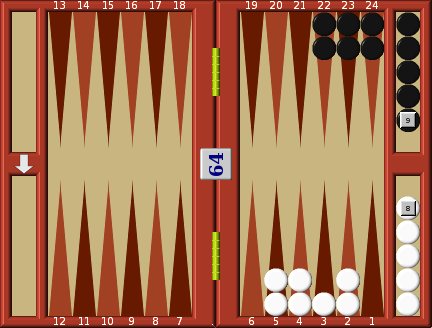 Diagram illustrates another safe pattern, again 6:6, 5:5 or 6:5 can be played in complete safety. Note that in both the last two diagrams, the number of men on the 6 and 5 point add up to an even number. If you get uneven numbers of men on the 6 and 5 points you could be in trouble. Diagrams illustrate two such dangerous patterns of men. Try to play 6:6 or 5:5 in either diagram, or in the case of diagram even a 6:5. In every case you will be forced to expose a blot. In contrast, diagram illustrates a safe pattern in which you can play any dice combination in complete safety. Note once again that the total number of men on the 6 and points add up to an even number. With an opponent waiting on the bar, the correct play is first of all to move your three surplus men down to the lover points, and then, when you commence to break your home board always do this from the highest point, taking off and moving down, so that no gap ever appears between the men. In diagram you would play 6:4 by removing the 6 moving the other man 6-2. Remove one man from 5, and move the other 5-4. 5:1 in this situation is an unlucky throw that puts you at risk. Both possible solutions are unsatisfactory, but (1) is far worse than (2). In the case of (1) you will expose a blot on your following turn if you throw 6:6, 6:5, 6:4, 6:3, 6:2, 6:1, 5:6, 5:5, 5:4, 5:3, 5:2, 5:1, 4:6, 4:5, 4:4, 3:6, 3:5, 2:6, 2:5, 1:6, 1:5, a total of 21 adverse permutations of the dice. In the case of (2) you will expose a blot on your next turn if you throw 6:6, 6:1, 5:5, 5:1, 4:4, 4:1, 1:6, 1:5, 1:4, a total of 9 adverse dice permutations. Diagram illustrates another dangerous pattern. If you have any choice, try to avoid ending up with 3 men on your highest point. 6:5, 6:4, 5:6, 5:4, etc. 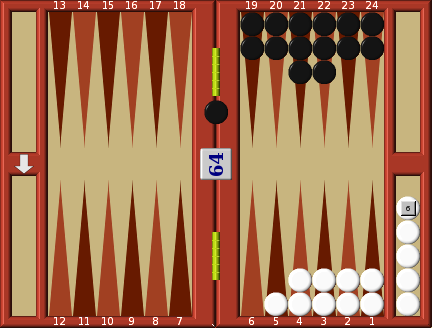 would all force you to expose a blot, and even with five men off the board, if you are hit, you are almost certain to lose the game. 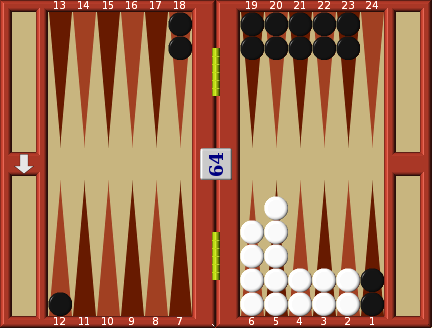 Diagram illustrates a mistake that is very frequently made by inexperienced backgammon players. You have probably ended up in this situation by incorrect play a move or two back, and you were forced to expose a blot, which, much to your relief, was not hit when Black threw 3:4 and was unable to re-enter his man. Now you throw 5:1 and with delight remove the man on 5; but how do you now play the 1 without again exposing a blot? There is no safe way to play it, a blot must be exposed. Now put back the man you took off 5 and start again. 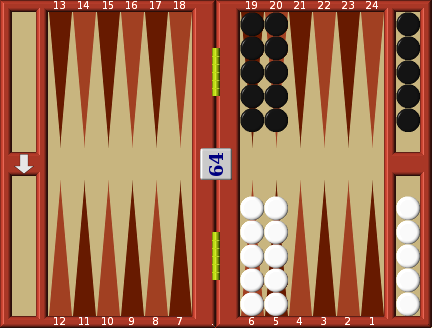 First of all remember that there is no rule in backgammon that states that the higher die must be played before the lower die. So this time play the 1 first by moving 5-4 and then you play the 5 to remove the same man from the board. In this way no blot is exposed. It's simple when you know it, but so easy to forget in the heat and excitement of the moment. In many ways this situation is the opposite of having an opponent on the bar. Your opponent is so far behind in the game that he will stay on your one point as long as possible in the hope that he can reverse the situation by hitting one blot. To expose one blot to your opponent is bad enough, but if you expose two to him disaster is virtually certain. Diagram illustrates the most dreaded situation. Throw a 6:5 and two blots must be exposed. Memorise this position and try never to get yourself into it. So, unlike the opponent on the bar situations, where correct play is to get your surplus men down to the lowest points before you begin to bear off, here you try to place your surplus men on to your highest points. In diagram you have all your men piled onto your top points. Now you can play high throws by removing men from the high points, and low throws by moving down from the higher points to the lower ones. All the time you play safe moves, hoping that your opponent will soon be forced to remove one of his troublesome men by throwing a 6 that cannot be moved anywhere else on the board. If the opportunity arises do not be in a hurry to remove your men from the board, but pile them up on the lower points into a safe position as illustrated in next diagram. Now the possibility of your exposing a blot before Black is forced to move out is very remote. You will have ample time to remove your men and win once Black starts on the journey home, so in the meantime play with safety. Diagram illustrates a situation where greed and prudence fought a battle in your opponent's mind, and greed has won. He decides to go all out to gammon you, so having thrown 4:4 he decides to remove 4 men from his 4 point. The danger that lies in front of him is the gap in his ranks on the four point, and that gap may well force him to expose a blot. You throw 6:3. You must play into the gap he has left, and naturally you move the 6 by playing 13-7, to complete a prime. By placing a man on 21 you greatly enhance your chances of hitting a black blot, should he expose one. If Black now throws 6:4 he must leave a blot on B6, and your choice of move has greatly increased your chances of hitting, and winning the game. Diagram illustrates another situation, almost certainly brought about by a greedy attempt to win either a gammon or a backgammon. The more gaps your opponent opened up between you and his men, the greater the likelihood that he will be forced to expose a blot. In this situation you throw a 6:1. 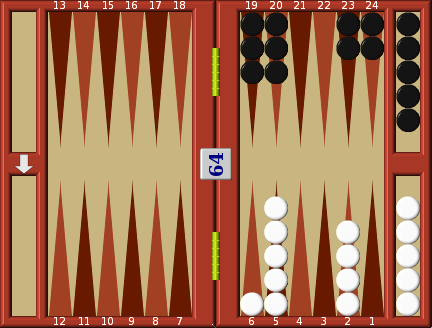 The correct play is not to panic and run with one man to try and save yourself from a backgammon. You play the 6 into your home-board, and with the 1 you split your two back men so that they occupy the 1 and 2 points. On his next turn only 6:6, 5:5, 4:45 3:3, 4:1, 1:4, 3:2, 2:3 can save him from exposing a blot. All other throws will force him to expose between one and three blots. The throw you would like best would, of course, be 2:4. Then he must expose three blots. Your back men are split and must almost certainly hit one or more. If you only hit one you will not save the game, but you will save a gammon. If you can hit two you will very likely win the game. In diagram White's situation is not so good. This is an example of an opponent who has played with caution, and you are now in real danger of being backgammoned. There is only one point in your favour: he has an odd number, three men left on the two point. The chances are that, with the exception of a double, he will almost certainly leave one blot on his next turn. 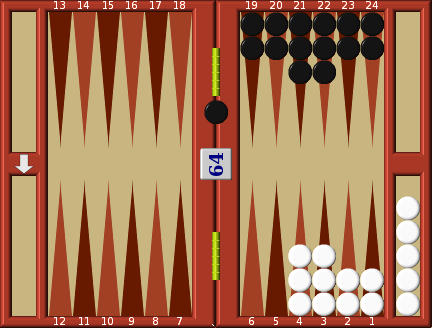 So in this situation you run with one man so that if you fail to hit his blot on your next turn you have some hope of being able to get your last man out of his home board to save the backgammon. There is also another reason for moving one man out. So long as you have two men on the one point your opponent does not have to play a 1. By moving out you now force him to play the 1 by taking you off. For example if he throws 4:1, and you have not moved one man out, he removes the 4 and does not have to play the 1. If you have moved one man out and he gets 4:1, he removes one man with the 4 and now must take you off with the 1, exposing two blots to you when you re-enter. Move with the two men on 7. Your instinct will probably tell you to move the two most distant men so that you do not open up a gap in your ranks, which as we have already discovered increases the chances that you may be forced to expose a blot. In a back game situation the same reasons do not apply. You have to be lucky not to expose a blot in a back game, and there is nothing you can do about this luck. The main consideration is not the probability of exposing a blot; instead you should ask yourself how you can force your opponent to destroy his back game position as early as possible, hopefully before you are forced to expose a blot to him. As you study the diagram you will note that if you do move from 9 your opponent will now be able to play any 6 by escaping with his one surplus man on 3, whilst leaving his back game situation intact. If, however, you play the 5:3 from 7 he will be forced to play his sixes by moving a man from 1. This is exactly what you want. The moment he does this his back game position is destroyed, and you should quickly be able to hit his blot and cover your man on the 1 point. In a back game situation, select the moves that enhance the chances of your opponent being forced to destroy his own position, rather than playing for maximum safety. 1. Remove a man from the board, rather than move within the board. 2. When you have to move a man, select the move that fills in a vacant point. 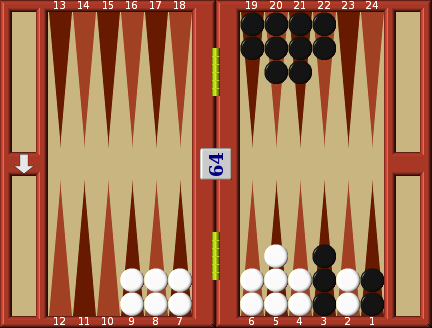 In diagram we show Black and White each with five men on their 6 and 5 points. Let us make both of them play the same throws. 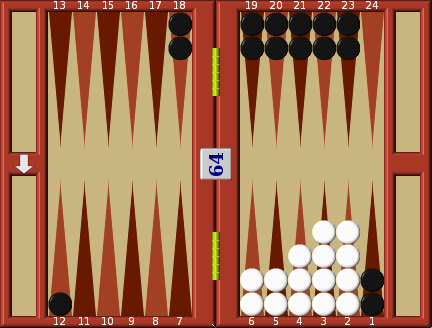 In diagram 4:4 is played correctly by Black; he has filled in two vacant points. White has mistakenly moved four men off his 6 point with the idea that it will help him to win if he empties his top points before Black. 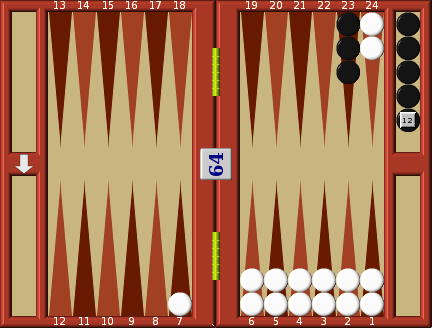 Now any throw containing a 1 will enable Black to get a man off the board, whereas White will have to move within his board and will fall one man behind in the race. In diagram the throw is 2:1. 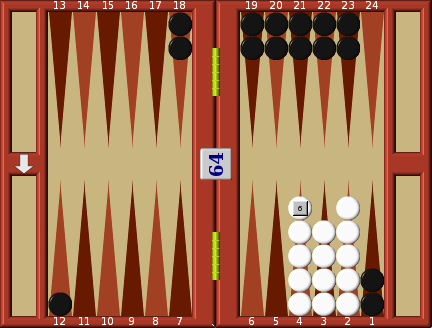 Again we show Black moving correctly to fill in two vacant points, and White has moved incorrectly. There is only one situation in which you do not follow the two basic rules for the bearing off race. In diagram you, as White, are behind in the race. You have just thrown 6:1; how should you play it? Normally you would remove one man from 5 with the 6, and move 2-1 with the, to fill in a vacant point. This situation is an exception. You can see that whatever happens your opponent will be off the board in 3 turns, which means that after this turn you will have only 2 throws with which to get all your men off the board. You are a certain loser, unless you get a lucky double. Therefore you select the move to increase the chances of removing four men in one go, should you be fortunate enough to get a double. With the 6:1 you now remove one man from 5, and move 5-4. By doing this you can now get 4 men off the board with 6:6, 5:5, 4:4. 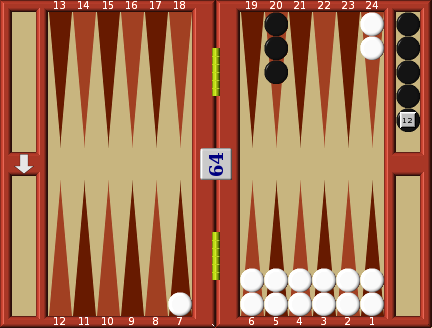 Had you played the normal way only 6:6, 5:5 will get four men off the board. 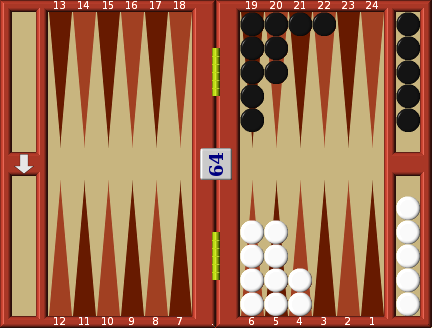 By selecting, this move you have increased your chances of winning by about 3%, not a great deal by itself, but if in your play, game after game, you are always selecting positions that marginally increase your chances of winning, you can be quite sure that the laws of probability will work in your favour, and you will become one of those players who win more often than they lose.